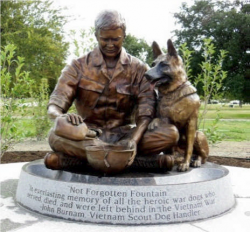 The development of the Military Working Dog Teams National Monument (MWD) was spearheaded by Mr. John Burnam, a U. S. Army combat infantryman and German Shepherd Scout Dog Handler during the Vietnam War. While his war dog partners died in Vietnam he wanted to keep their memories alive and mounted a campaign to create the monument. To provide the foundation for the project he established the John Burnam Monument Foundation in 2008. With the support of Congressman Walter Jones, R-NC, the National Defense Authorizations Act for 2008 was amended and authorized the Burnam Foundation to design, fund, build and maintain the Military Working Dog Teams National Monument. The Burnam Foundation solicited private and corporate donations and collected more than $2 million for the publicly funded National Monument. Since the Monument could not be placed on the National Mall in Washington, D.C., Joint Base San Antonio — Lackland was the most appropriate alternate location. The local command welcomed the National Monument and provided the land needed to build it adjacent to the parade ground. The monument was constructed and unveiled on October 28, 2013. In 2014, the John Burnam Monument Foundation was deactivated, gifting the structure to Lackland, and transferring maintenance of the Monument to the Airman Heritage Foundation. 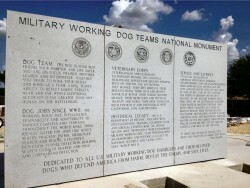 It is most fitting that the MWD National Monument was established at JBSA – Lackland. Historically, the base has been the recruiting and training facility for the U.S. Armed Services military working dog program since 1958. It also provides training for working dogs for other government agencies. Lackland is also home of the Holland Veterinary Military Working Dog Hospital, the only one of its kind. For those who need access to JBSA – Lackland to visit the monument, please call the number below or send an email to schedule a visit. We are proud to offer the opportunity to honor military service members, who through their dedication, sacrifice, courage, and valor have contributed to the preservation of our freedom and way of life. Our Airman Paver Program presents an ideal way to render such recognition. Get your Legacy Paver today.